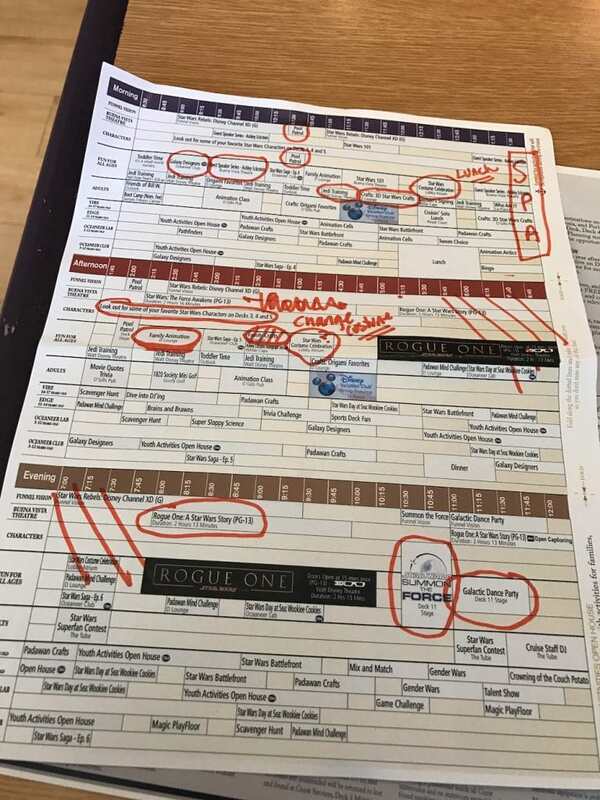 There are plenty of cruise lovers out there who are interested in hearing more about Disney’s Star Wars Day at Sea. Well, I just came back from that adventure and I wanted to give you a few things to look forward to should you book a trip this year or next. That’s right! 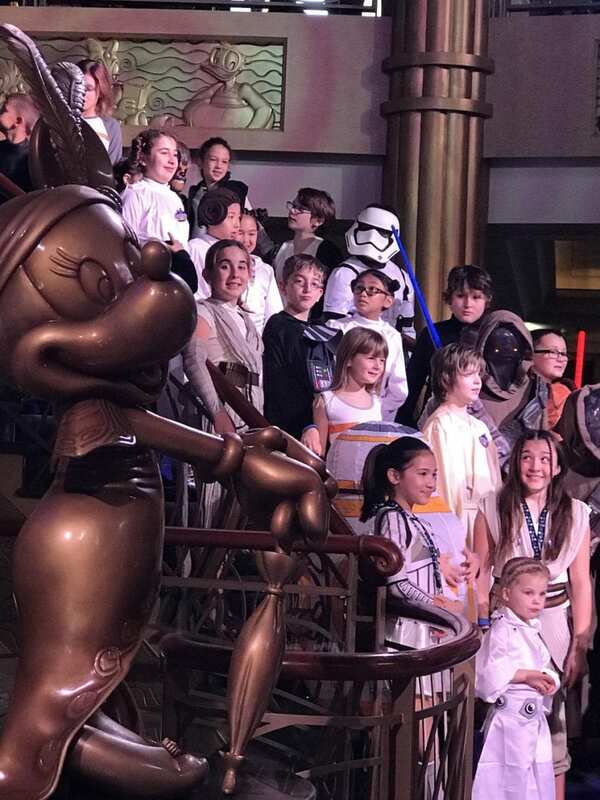 If you don’t make it on board one of the Disney Cruise ships in 2017, you will get a chance to enjoy Star Wars Day at Sea in 2018. The company just announced that they are extending the celebration for another year. YAHOOOO! I want to give you a look at how we split out the fun. Everyone can choose to celebrate in their own personal way. This is how we did it. Be sure to bring a highlighter or a Sharpie marker because it will save your LIFE every night while you are planning your itinerary on board the ship. A simple pen or pencil didn’t cut it for me. Just a personal tip. There are plenty of repeats throughout the day – so if you happen to miss something, don’t worry!! You will be able to do it later on. Disney is nice like that. 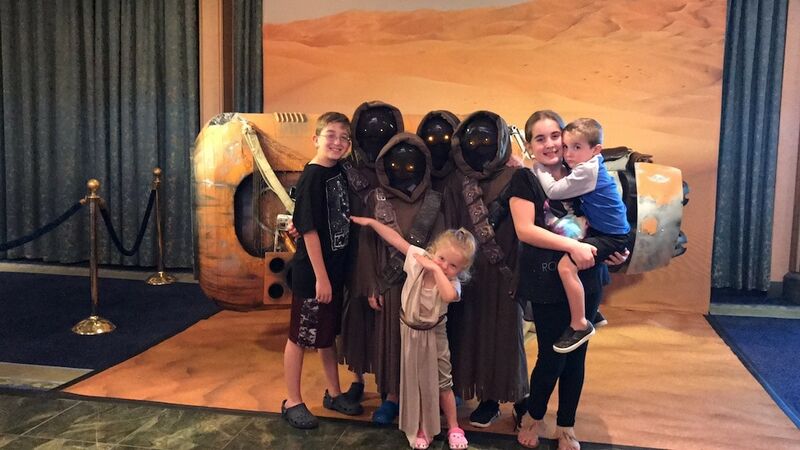 Ready to see our highlights from Star Wars Day at Sea? 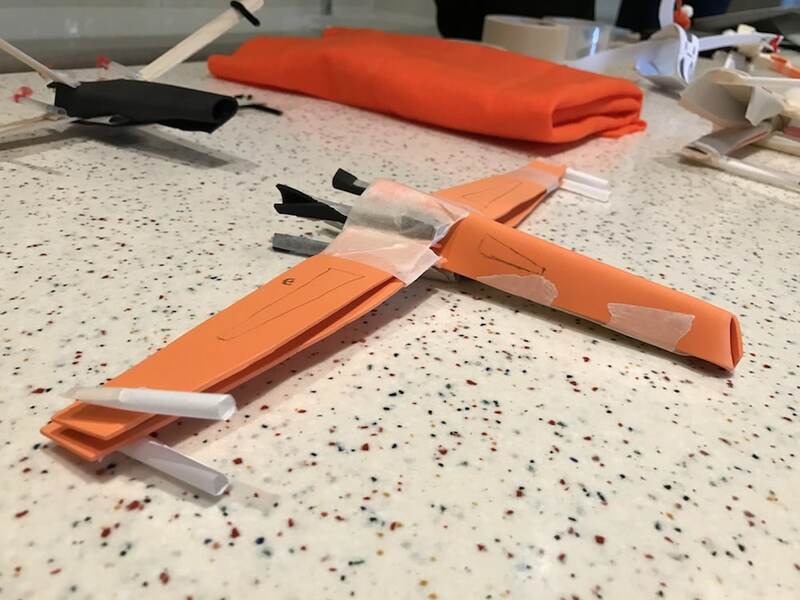 The kids made their own spaceships in the Oceaneer’s Club during open house hours. That meant that Bill and I were able to join in on the fun. 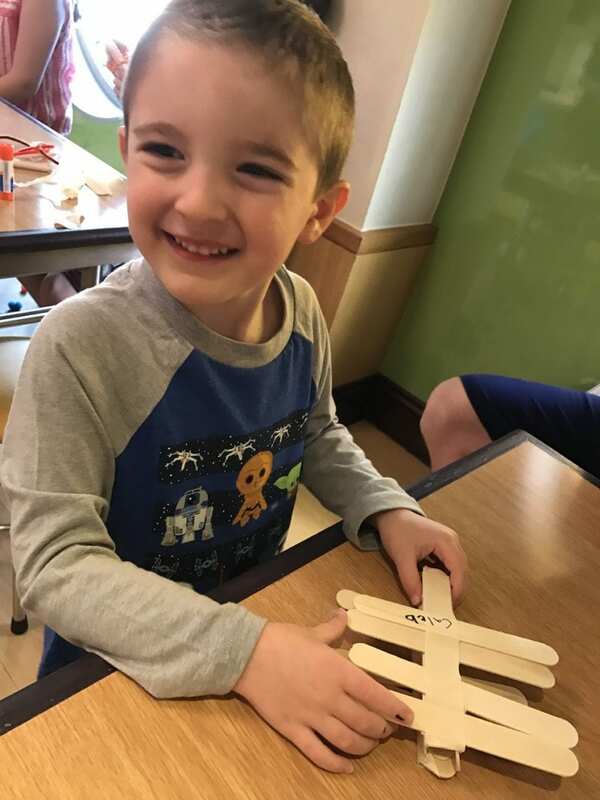 Each child made their very own unique design. Natalie’s was filled with hot pink furry balls while Caleb’s was as plain as can be. But you know what? Everyone had a smile. That’s all you could ask for. 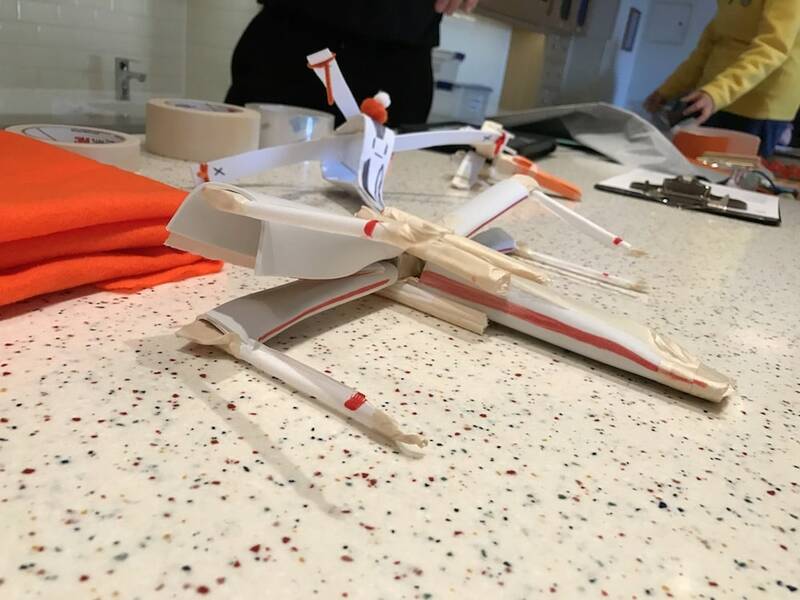 The top two pictures were samples from the crew. Don’t want you to think my little ones made those spaceships. LOL! 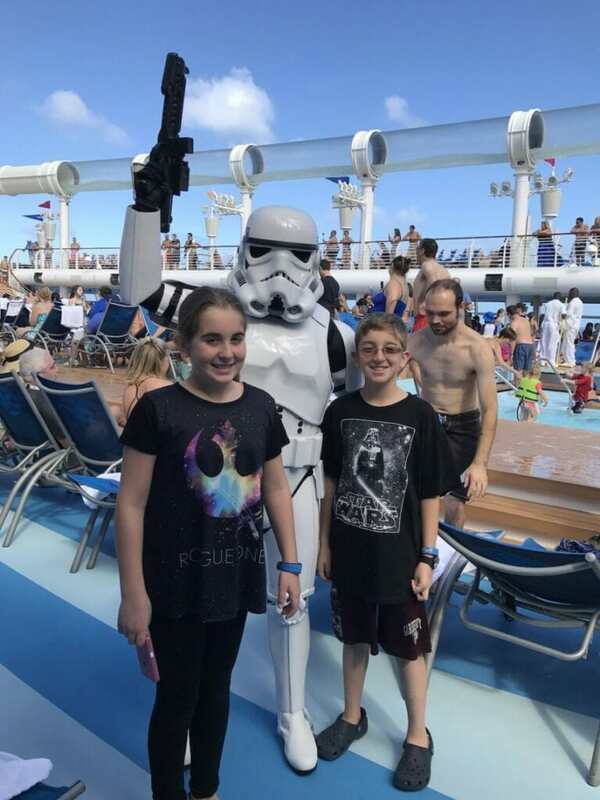 We also had a little fun checking out the Stormtroopers taking over the pool deck. They were apparently looking for someone on their most wanted list!! But luckily they had a few minutes to stop and take a few photos. SWEET! Throughout the ship, you’ll find plenty of Star Wars gear and goods. Everywhere you turn! Snap. Snap. Super fun. 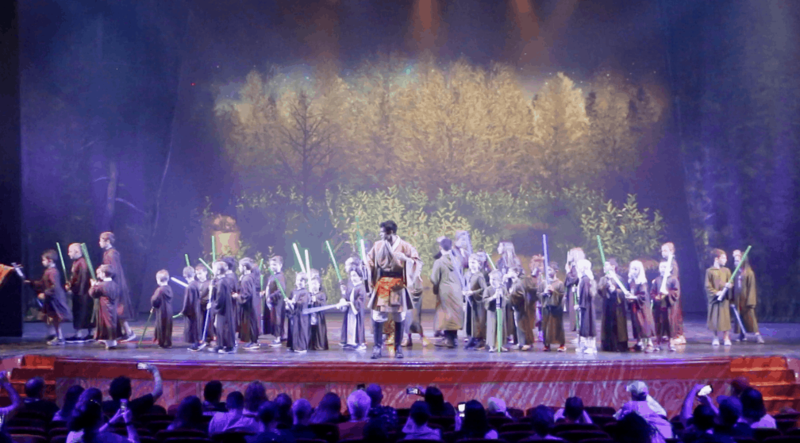 And if you want your kids to get some Jedi Training – you are in LUCK! Several shows are scheduled throughout the day. 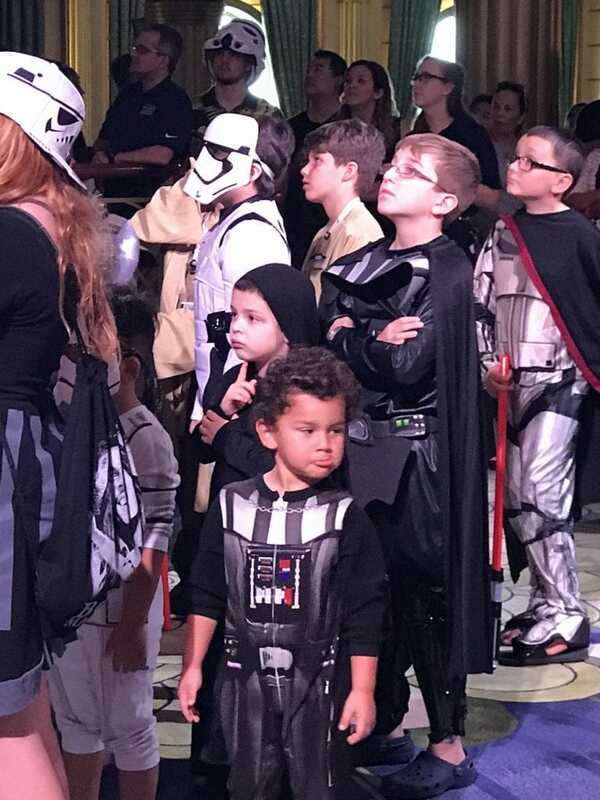 Darth Vader was NO MATCH for these young warriors. The Star Wars costume celebration was a new addition to the programming this year and I am SO HAPPY it happened because it gave everyone a chance to show off their looks. They split the presentation out into the good, the bad, and the neutral. So, everyone had a spot on the floor!! I especially loved looking at those people who made their own designs. Or better yet – parents and children who got up together as a team. Really great moments for all. I mean…. check out these costumes! Every shape and size. Some even had the chance to get interviewed! A big round of applause for all the kids once it was over. 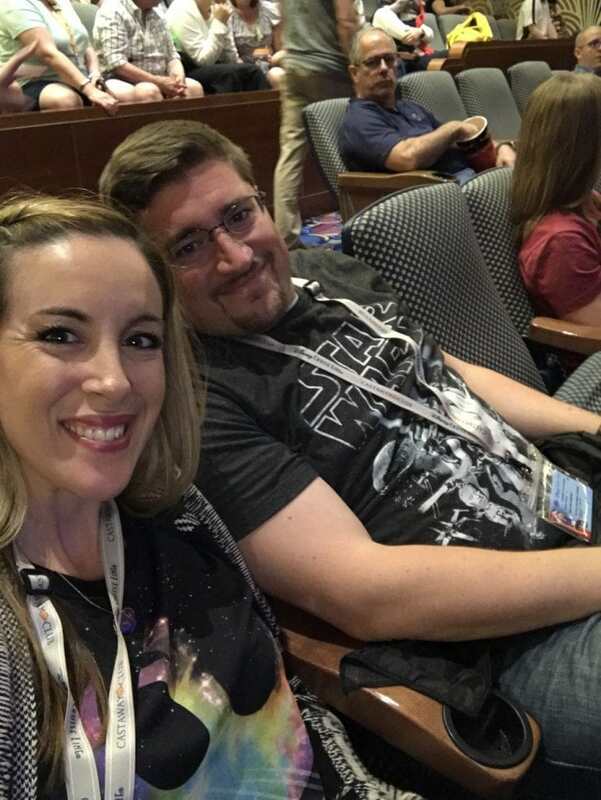 What a wonderful Star Wars celebration!!! All week long, you have the ability to watch Star Wars movies in the theatres (3D or not). 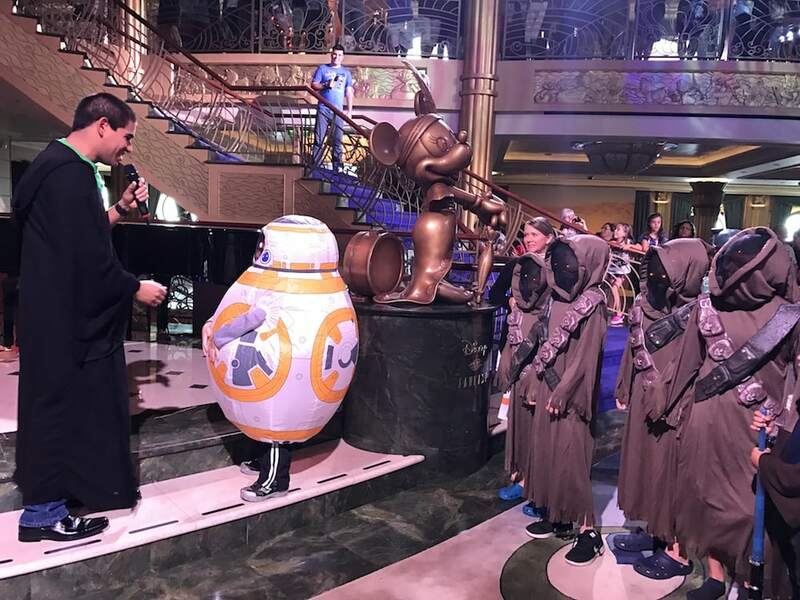 On Star Wars Day at Sea, our Disney Cruise showed Rouge One — the newest installment. I was super excited because I hadn’t had the chance to see the film yet! BONUS that I did it on the cruise. You want characters? You got characters!!! They are all waiting for a photo with you in their true form. The night before, your stateroom will receive tickets that will tell you where to go. 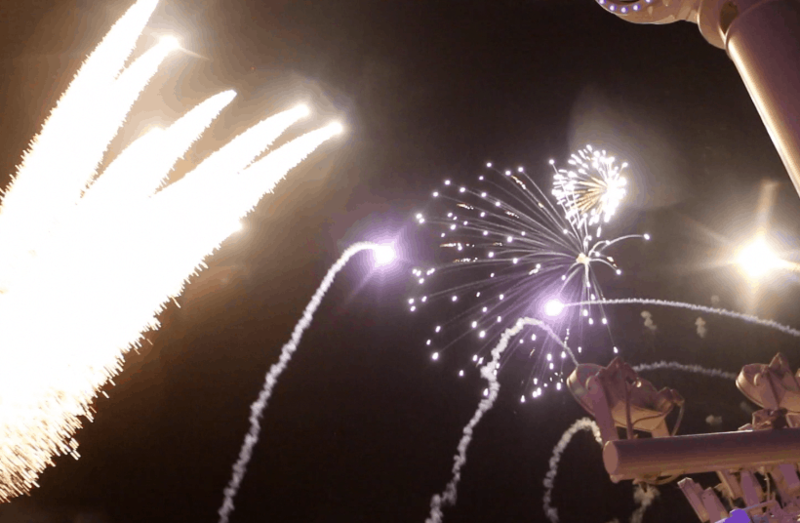 Last but not least, it all ends with a firework presentation on deck. The kids danced, watched the light show, saw some more characters from Star Wars and then enjoyed an insane midnight buffet. A PERFECT day if you ask me!! What are you waiting for?? Click here to learn more about your next Disney Cruise! I will have to check their schedule. 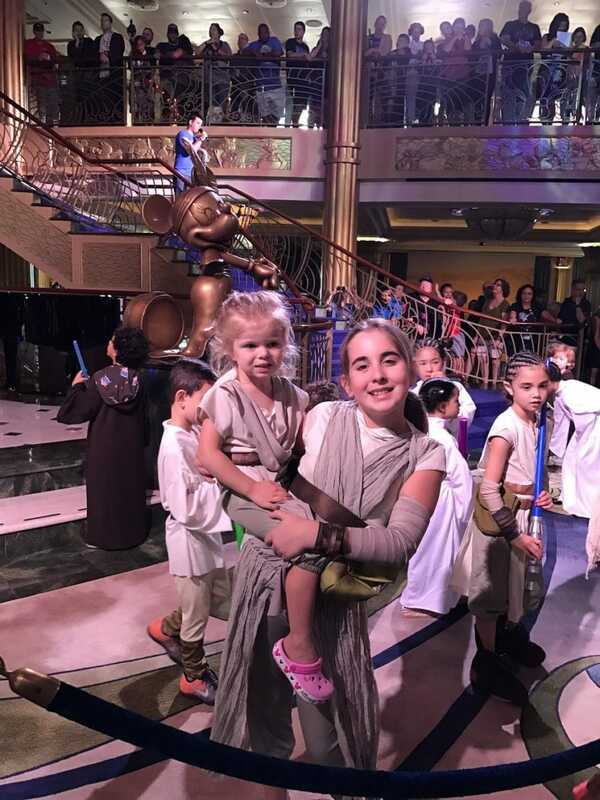 I would love to be on this Disney Cruise Star Wars Day at Sea! I am a big fan of Star Wars! My family goes on a cruise (or two) every year and this one would be a must! Wow, that looks like a wonderful experience for all! 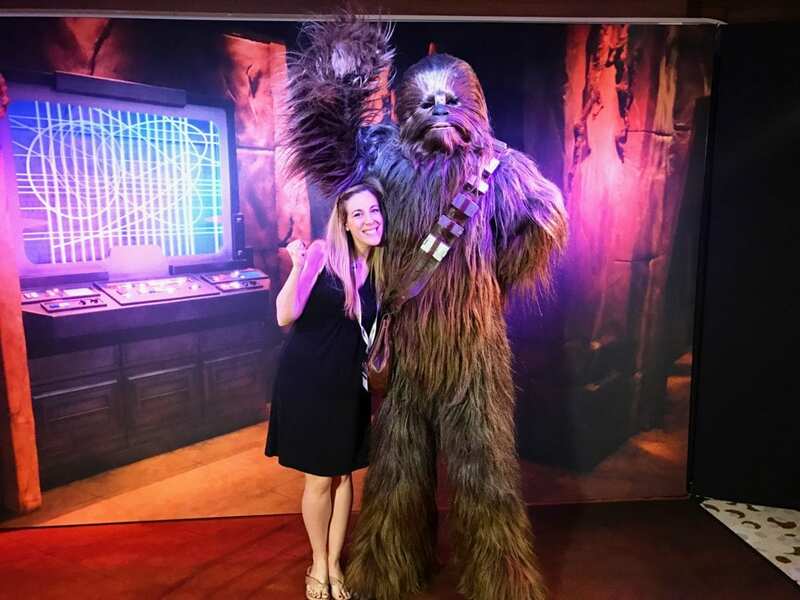 Chewie is seriously big! That is the coolest thing EVAH! I’m a huge Star Wars fan, so I would love to spend an entire cruise basking in The Force. VERY cool. Wow, this looks like t was such a good time. My husband and I both love Star Wars and we should definitely do this. Thanks for this post, amazing! Whoa! Star wars is my favourite too. Looks like you guys had a great fun on cruise. We have never been on a cruise but would love to visit and explore such fun events. My husband is a huge fan of star wars stuff! He would love this for sure. I’m pretty sure that you had fun adventure with them! I really love your pictures.